There's an interesting post from Flurry out today, but I wouldn't read too much into it. According to Flurry, they've been tracking the in-app purchases of a set of apps found in all 3 markets (they track lots of apps, but today we're only interested in these few apps). Over the last 45 days, Flurry has noted that for every buck the apps have generated in iTunes, the same apps have earned $.89 in the Amazon Appstore, which is a pretty decent accomplishment for such a young appstore. But what's even more interesting is that the apps only earned an average of $.23 in Google Play. While it is interesting to see how the app stores compared for a particular set of apps, I think this data set is a little to small to be generalized into a conclusion for all markets. I have a number of different problems with the report. First, it only reflects one type of app income. It excludes ad revenue and app purchases, so any app that uses one of those as the primary revenue generator has been ignored. For example, a couple months back I told you about one dev who was earning almost as much from Amazon as he was from Google Play. He didn't do in-app purchases, so any income he got would never have made it into this report. Another caveat with this data is that it is limited to only apps found in all 3 stores, so that dev would never have even been considered for the report. 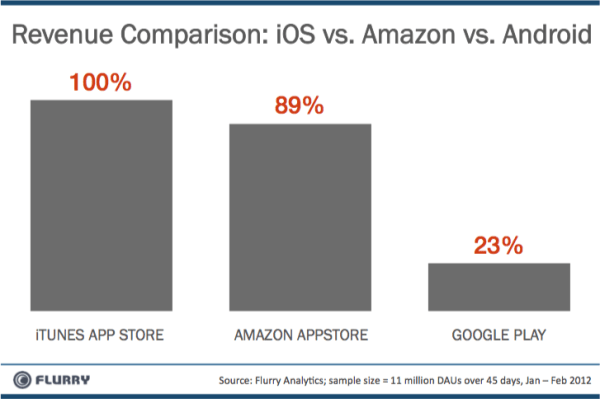 And in case you forgot, Google Play has 15 times as many apps as Amazon. So even if the average is higher across the apps used for the survey, the total volume of income generated by Google Play will still be higher than Amazon. Sorry to be nitpicky, but over the past few weeks I've read several academic papers on ereaders in the classroom (here, here). All of the papers used a heavy dose of statistical analysis on the data before drawing any conclusions. I cannot help but feel that we would learn more about the app stores if Flurry would pull in all the data they have from all the app stores and then run a statistical analysis on it. Oh, and we don't know what kind of analysis Flurry did, so for all we know they simply added up the total sales and then simply compared the numbers. Even I know there's more to stats than that. Nook Touch Hits $65 on Ebay – Is This the Beginning of The End of B&N? B&N to Launch “Nook Audio” – MP3 Player, Dock, ?